Chef Andrew Carmellini, and partners Josh Pickard and Luke Ostrom, have transformed what was once Chinatown Brasserie, into Lafayette, and it is stunning. Designed by firm Roman and Williams, Lafayette is called a "Grand Cafe" on their website, and it truly is grand. I stopped in on Monday, their first official day of opening, and was in awe of the space. Paired with this grand space, is Chef Andrew Carmellini and Chef Damon Wise's fabulous cooking, and what you get is the hottest restaurant in New York City right now! Selles-sur-Cher Tartine ($8), with radish and tomato was perfect. It was like a picnic in your mouth, and I loved this bite from their "French Market" section of the menu. Foie Gras Terrine ($20) comes with huckleberry, and served with fresh brioche and is great too. Creamy, delicious, perfection. 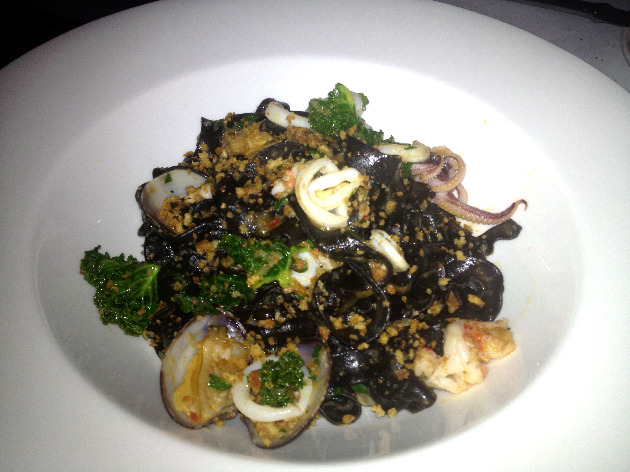 Black Fettucine ($25) comes with seafood and chorizo and is truly awesome. Great seafood flavor. A sensational dish. I could not stop eating this! 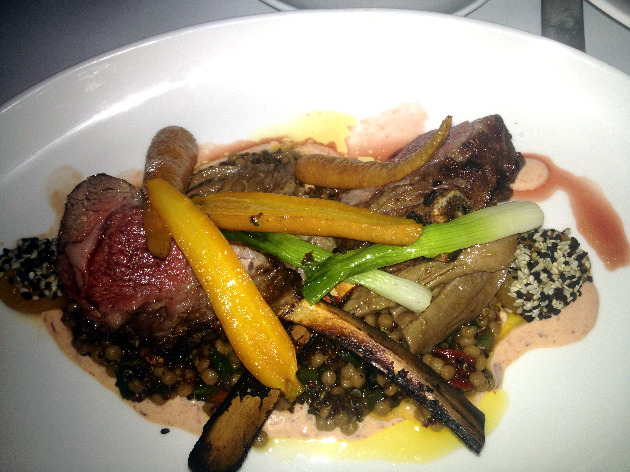 Lamb Chops Marocaine ($32), with whole wheat cous cous is unbelievable. Tender, Juicy, Flavorful, Awesome. Lamb Chop Perfection. A Grand and Fabulous dish! We ended this fabulous meal with a Sweet Cheese Cremant ($10) with blueberry sorbet and cornmeal croutons. It was light, excellent, and also quite perfect. The words that kept coming to mind when dining at Lafayette were "great", "solid" "perfectly executed", "grand", "picnic", "magical" and "awesome". I really enjoyed dining in this wonderful space, feasting and deliciously executed fare. Lafayette is the "hottest" restaurant in NYC right now, and I expect it to be for a while. I'll be back soon, and I hope you join me. A magical night awaits.